L: 114" x W: 102" x H: 41.5"
Connell 3-pc. Power-Reclining Sectional Sofa w/ Heat and Massage If you're looking for something comfortable and good looking, the Connell 3-piece sectional sofa has you covered. This sectional has it all with its heated massage seats, power reclining options and a power headrest. Plus, the cupholders are lighted AND keep your drinks cold. Too good to be true? No. You'll also get built-in USB ports so you can keep your devices charged. If you're looking for something comfortable and good looking, the Connell 3-piece sectional sofa has you covered. This sectional has it all with its heated massage seats, power reclining options and a power headrest. Plus, the cupholders are lighted AND keep your drinks cold. Too good to be true? No. You'll also get built-in USB ports so you can keep your devices charged. I have bought various pieces of furniture from Raymour and Flanigan over the years and have been very pleased with the product and customer service; however, beware of this sectional. I have only had the furniture for 10 months and it is horrible. The clips on the corner wedge keep lifting and the back becomes disconnected. My son almost flipped over when he leaned back. I have repeatedly had to unplug the couch and wait a few minutes before plugging back in because the touch screen goes wacky. Now, the touch screen isn't working at all, the heat came on by itself more than once making me fear a fire, and one of the recliners is stuck part way out. The fabric is soft however it is very loose. There are pulls in the fabric all over. I made an appointment for repairs for today and my daughter has waited all day while I'm at work. I call to find out the appointment was cancelled with no one notifying me. What??!! Now I am stuck with a piece of furniture for the holidays that is not functional. I haven't paid this off yet but am afraid someone will get hurt or there will be a fire in my house. Hello Michelle, we're very sorry to hear about this experience and would like to look into this for you. Could you e-mail your order details, contact information and a copy of your concerns to rfcare@raymourflanigan.com so we can better assist? Thank you! I love my new sectional! It is a great size and fits perfectly in the space I have. It is extremely comfortable. The reclining chairs with the heat are perfect for when I have to sit and study or do homework for a long period of time. I am extremely happy with this purchase. I always wanted a sectional - and I am so happy with this one. Barbara, my saleswoman, was very helpful and patience while myself and family tried different options. The picture and from what I recall - it could have just been the lightening or setup in showroom - is lighter. This sectional is darker and seems more blue - No complaints what so ever! It is comfy, the massager is a little noisy but not overbearing... The heated seats are enough to keep one cozy while watching tv. The adjustable headrest makes viewing our tv very relaxing because we can adjust to our personal settings. This is not a sectional that one sinks in, but one to relax in. I love this sectional they are very comfortable not too big not too small, just adjust everything to the comfort of your body and relax. I absolutely love this product. It is very comfortable and understandable. Super comfy and I love the color! Hello Vicci! I have emailed you directly including the user instructions for the console screenpad. We're glad to hear you are enjoying your new sectional sofa, and thank you for taking the time to leave a review. We hope to see you again soon! Jeff, our salesperson, was so helpful with our purchase. we loved this sectional from the time we saw it. It was a perfect fit to our living room. The delivery guys were polite,quick and very respectful ! Quality of couch is well beyond our expectations. The salesman who worked with us getting this piece of furniture called us to make sure that everything went great ! Thank you to you and your staff. Not only are we loving this couch, the service we received at Raymour and Flanigan was incredible! We shopped around at many of their competitors and were appalled at the service we received by them. Raymour and Flanigan made lifetime customers of us. The build quality of the Connell is great. Seats are firm, functional, fabric is soft and easy to keep clean, and the features are great. The massage feature timer is the only downside on the couch. It lasts only about 4 minutes. The heat and massage only occur on the back portion of the couch but I wish it was on the seat as well. Otherwise, I have zero regrets on this purchase and would recommend to anyone in the market for a piece of furniture like this. We've only had it for a few days, but my husband and I love it so far! It looks great and it's super comfortable. The massage and heat features are a big bonus. Here's hoping it holds up long-term. Quality on all levels, no complaints.This piece of furniture has it all for sue. Best couch and staff I've ever seen. I love the couch but think everyone should double Even triple check with ur sales person to make sure it is sent correct! The couch is well made and very comfortable. I would recommend this to anyone that lives spending time watching tv with the family . My only complaint was the first delivery of the couch it was sent wrong . They had to resend new prices a few days later . So far we are very pleased with the comfort of the lounge chairs but wish the controls were a little less complicated. One section has an opening between chairs we do not feel should exist. Wires in the back are exposed but probably due to our arrangement not being against a wall. However, at our age, we cannot move the furniture to adjust and will ask Raymour to send installers back. No instructions for the remote panel were left and we had to use trial and error process. In summing up the furniture, it is a good addition to our living room. Perfect size for our home. Color is great. Disappointed that the heating feature on one side does not work. Can't get it fixed for two weeks. Brand new and not perfect working condition. Frustrating. Nice we are loving it and enjoy in it thanks to all. Overall this is a great couch. Feels very high end with the touch screen panel to control the heat, massage, cooling cup holders, adjustable recline and head position. Love that it has the charging station at the center console. 2 USB ports and a standard plug. Opposite end of the couch has USB charging as well. The only real con is sometimes the touch screen panel freezes requiring power reset to the couch. Other than that it's a fantastic couch. Could recline a little further for my husband, but works great for me as I like to sleep with my head more elevated. Love the look and comfort! Need to call Raymour and Flanigan to fix corner wedge! It is not locked in properly and therefor back cover doesn’t reach down far enough to catch the Velcro! Delivery people had a difficult time hooking it up, it unclipped within an hour! Hopefully once the come back, it will be a 5 star! Hello Jacqueline, we apologize this has occurred! If you could, please email us at rfcare@raymourflanigan.com with your order detail, contact information and a copy of your concerns, we will forward this to the correct leadership group. 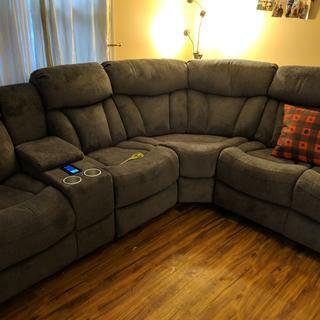 It's a nice couch however it's very firm and it's extremely staticy which means every time my family and I sit on it we shock each other or ourselves on something. Also cup holders are a nice idea, however, they do not keep anything cold. Don't be fooled by the bells and whistles. I've had this sectional for just under a year now and at first it was amazing. Heat, massage, recline. As time wore on, however, this couch didn't measure up. I'm short so the contouring of the cushions is not comfortable at all for me. It's very staticy and holds every piece of pet hair, people hair and fiber it comes into contact with. The fabric is soft however the weave is super loose so it pulls ALL THE TIME! I haven't had any problems with the control panel but honestly, we dont use it too much. Don't be taken in by bells and whistles. Unfortunately, I still owe, so here I sit on my most hated piece of furniture. It's the most comfortable sectional I've ever owned. Friends come over and don't want to leave. My daughter's friends want to spend the night and sleep on the sofa. Having 3 recliners is the best. Usb and outlet not working is there a switch somewhere? Everything is plugged in? BEST ANSWER: A reply has been sent directly to your personal email address. If the information provided is not beneficial please contact our customer care team at 1.866.383.4484 for assistance. USB and Power ports are not working, sectional did not come with an owners manual. Is there some switch that needs turned on? 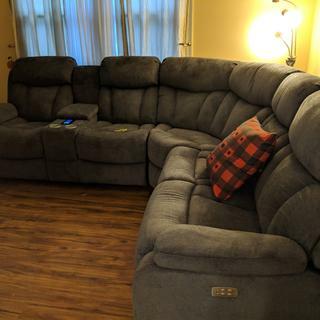 can the loveseats be reversed? BEST ANSWER: Yes. The configuration can be reversed. How do I get a manual for this couch? I talked with customer service, they have a 2 page printout they can give you although it’s not any good information. As far as the USB there is an additional plug right behind the console that is for the USB that the guys didn’t plug in for me. It’s tucked underneath out of sight. The keypad never goes off and as per Raymour and their manufacture there is no way to turn it off unless you unplug the couch itself. OMG THANK YOU!!! It was the plug that was hidden up in the couch!!! We asked customer service if there was anything we could check to see if the USB would work. They said no it has to be replaced! The movers were in such a hurry to leave they never checked to see if everything worked!!! THANK YOU SO MUCH!!! We owe you a beer!!! Just recieved couches earlier today and the USB ports don’t work on the piece with the massaging unit but work on the other end of the sectional. How do I get these to work? Also I see others asked for a user manual, can I get a copy please, thank you. BEST ANSWER: Hello Mary! We're sorry to hear about this experience. There may be a second power cord to plug in, if not, please contact our customer care department at 866.383.4484, option 7. We would be happy to help you as soon as possible. I have also emailed you the manual instructions directly to the email you have provided on this post! I got my couches yesterday and the USB ports don’t work on the piece with the massaging unit but work on the other end of the sectional. Do I need to do something to make them work? They have a separate plug that needs to be plugged in. It’s underneath the console. I had this happen to me when I first got it. Is there any way to turn control off? BEST ANSWER: The sectional would need to be unplugged to turn off the remote lighting. You would need to unplug the couch. So it stays lit 24 hours a day? Is there an owner’s manual? I can’t figure out how to turn off the light in the power switch and the heated seat on the left isn’t working the same as the right. BEST ANSWER: Hello Brandon, the screen light does not turn off unless the power cord is unplugged. A reply has been sent directly to your personal email address. Please contact Customer care at 866-383-4484, option 7 for additional product details. Call customer service and they can email a pdf document. I have had multiple issues with the electric components of this set. Good luck. Can control panel light be shut off? BEST ANSWER: Only by switching off the power to the couch. Just received 2 hours ago and USB ports dont work. Others asked same question yet no answers? How do the USB ports work? BEST ANSWER: Hi Michael, have you plugged in the power cord? No one told us there was a powercord!!! It was tucked away up inside the couch. Someone on here told me about it yesterday. Your movers were in such a hurry to leave they never checked to see if everything worked! 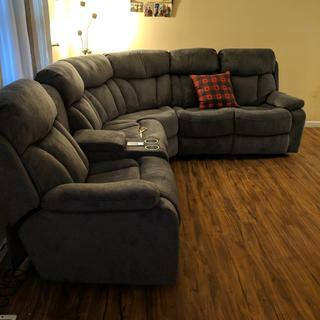 Can you pick out what pieces you want such as 2 love seats with cup holder and one straight seat because I do not have the room to make and L shape but I can go straight across the back wall? BEST ANSWER: Yes, you may choose the sectional configuration of your choice. Please contact our online sales department 866.383.4484, option 3 or visit your local showroom to order. We would be happy to assist! I love this sectional but I was wondering why the massagers only work on the first two setting for 5 minutes at a time and 6 minutes on the last massaging setting. Also, the heat turns on and off. Is this supposed to happen?? BEST ANSWER: The massage feature has 3 levels and automatically turns off after 5 minutes. The cooling cupholders and heating pad automatically turn off after 60 minutes. A reply has been sent directly to your personal email address including the user manual. Please contact Online Sales at 866-383-4484, option 3 for additional product details. My sectional does the same. I would say it's a safety feature. You’re probably right:) I love it anyway! How to change the color of cup holder lights? BEST ANSWER: You dont. Its red when warm purple for cool and blue when cold. It's all auto. How much distance is needed to recline? Is it a wall hugging sectional? BEST ANSWER: Hello Lea, thank you for your interest in the Connell Sectional Sofa! This sectional will fully recline with 4" wall clearance. What type of sofa covers work best for this model? BEST ANSWER: Raymour & Flanigan does not offer sofa covers. if they did I wouldn’t have asked this question. USB and power outlets are not working? Can you get the love seat with the storage on the other side ? BEST ANSWER: Yes! You have the option to change the configuration. I'm looking for a sectional that has a hidden compartment and cup holders and reclines on both sides? BEST ANSWER: The Connell 3-pc. Power-Reclining Sectional Sofa w/ Heat and Massage includes cup holders, storage compartment and has multiple recliners.